Months after chasing a trans woman from a restroom, Jazmina Saavedra now believes that she is a victim. Jazmina Saavedra, a former congressional candidate, made headlines in May for chasing a transgender woman from a Denny's restroom in Los Angeles. Months have passed, and she is still talking about the incident. 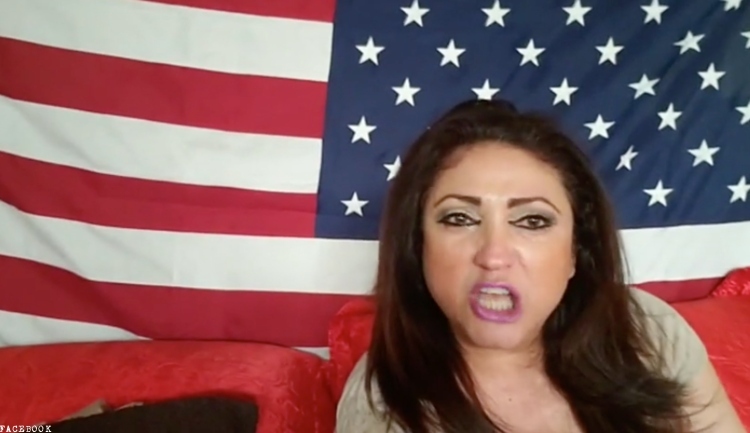 In a Facebook Live video published Monday, Saavedra went on a tear about the "stupidity" of the LGBTQ community, which she claimed has harassed her since news of the incident went viral. "They called me sick … hateful, you name it. Everything. What they don’t realize is they are the one with the problem, not me," said the Donald Trump-supporting Saavedra, who then denied and doubled down on the homophobia and transphobia she had been accused of. "I don’t have nothing, nothing against the gay people, against the lesbians," she said. "I don’t care what you do with your life in private. What I do care is you try to contaminate our kids, that you are trying to force the regular people to get into your nasty behaviors." Saavedra, retelling the Denny's incident, still insisted that the woman she harassed was a "gay guy in the ladies’ room." Evoking the "bathroom predator" myth, she said transgender people using public restrooms "put us in danger" and that she would advocate for transphobic teaching in schools. "This is about safety. I am so tired of the LGBT community bullying me. They are the [ones] who are hateful," she said. Denying charges of bigotry, Saavedra then claimed she used to lend women's apparel to a gay, HIV-positive cousin, who died in the 1990s after taking experimental drugs for the virus. In the May encounter, Saavedra repeatedly called a trans woman "a man" and peppered her with insults like "sick" and "stupid." The woman was eventually forced from the restroom, though Denny's corporate office later released a statement affirming its support for transgender customers and their right to use the restroom of their choosing. Facebook eventually removed a video Saavedra recorded of the incident, saying it didn't comport with their policies against bullying. After repeatedly reposting it, Saavedra was temporarily blocked from the social media site. Saavedra may have thought accosting a trans woman at a Los Angeles restaurant would win her votes, but it didn't quite pan out — the Republican came in third in her primary election earlier this year. Watch Saavedra's latest hate-filled video below. The flag, she noted in the caption, is "properly" hung, but it is the camera that makes it appear "backwards."